As you approach Arlington National Cemetery it is hard not to notice the mansion at the top of the hill inside the Cemetery. Arlington House, or to use its more official title, the Robert E. Lee Memorial, is one of the most arresting sites at the Cemetery, and one that is full of history and intrigue. Plus, the view from outside the house is amazing, its not A view of Washington, it’s THE view of the entire downtown Washington DC area. Arlington House has an incredible history, matching the cemetery surrounding it. The house has historical connections to so much of early American history, not just the Civil War, but the American Revolution as well. The house was built by George Washington Parke Custis, grandson of Martha (Custis) Washington, and step-grandson of George Washington. Custis, or Wash, as he was known, built a thriving plantation overlooking Washington, DC and planned on filling it with his collection of Washington Memorabilia. The land that the house and the cemetery are built on was Wash’s inheritance from his father and grandmother, and immediately upon Martha’s death, he started to plan Arlington House. Wash and his wife, Mary Fitzhugh Custis had only one surviving daughter, Mary Anna Randolph Custis. She grew up at the plantation and married her childhood sweetheart, Robert E. Lee at Arlington House in 1831. 6 out of their 7 children were born at Arlington House. When Robert E. Lee left the Union Army to join the Confederacy in 1861, his wife remained behind at Arlington House, unwilling to leave her family’s home. In May 1861 she received word that the Union was planning to occupy Arlington House, and managed to send most of her valuables away before she vacated. The house became the headquarters for the Army of the Potomac. In 1864, the Army confiscated the entire property, claiming that the Lee’s had not paid their taxes in person, a new law that was designed for exactly this purpose. Later that year, the land surrounding the house became a cemetery, making it impossible for the Lees to return to their home, even after the war. After their death their son sued the government, claiming they had obtained the house illegally, and won. The deed to the house and the land was given back to the Lee family, who promptly sold it back to the US Army. 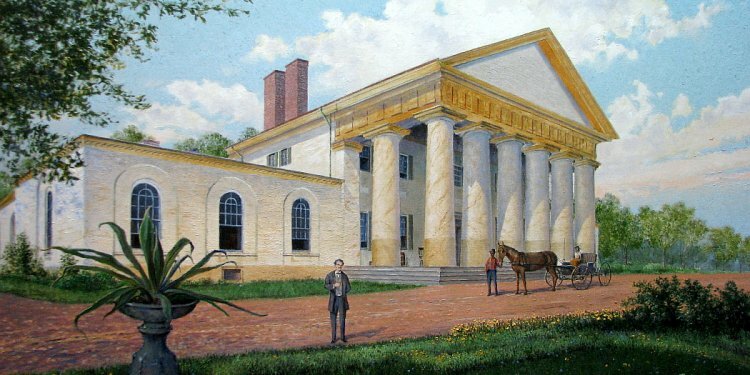 In 1955 Congress designated the house as a permanent memorial to Robert E. Lee. Arlington House is an architectural marvel, even today. It was designed to resemble a Greek temple, but not just any old Greek temple, the temple of Hephaestus in Athens. Even when the house was constructed, houses were rarely built on this scale, with the grandiose outside portico being visible from miles away. George Washington Parke Custis, wanted the house to be visible from downtown Washington, which it actually still is. Interestingly, Wash was planning on it being a memorial to George Washington, that didn’t prevent him from skimping on the building costs. The huge columns in front of the mansion are designed to look like they are marble, but they are actually stucco covered with hydraulic cement and painted to look like marble and sandstone! Extensive renovations continue to take place at Arlington House, preserving this beautiful historic home for the future. The rooms of the downstairs are set up the way they would have been when the Lee’s lived in the house, so that visitors can get a sense of the life that the Lees led there. You can also tour several of the out buildings, the summer kitchen and more. Along with the magnificent views of the city, it truly is one of the highlights of Arlington National Cemetery. Hours: Arlington House is open different hours from the rest of the Cemetery. Open from 10am to 4pm in the winter and beginning April 1 will be open from 9:30am to 4:30pm. Fees: It is completely free to visit the Cemetery and Arlington House. On busier days there may be a delay to enter the House, and there are restrictions on the number of visitors who can go upstairs in the House at any one time due to structural considerations. How to get there: As always, metro is probably the best option, although there is a dedicated parking lot at the Cemetery. The Arlington Metro stop on the Blue line takes you to within steps of the Visitors Center for the Cemetery. From there, Arlington House is at the top of the Hill. You can grab a map of the Cemetery at the Visitors Center or simply follow the signs up to the House. Alternatively, take our Arlington Cemetery Tour for the full scoop on the entire Cemetery and Arlington House, Saturdays at 10am all year long, and Fridays at 10am beginning in April.